Through most of this summer I have been working on timber stand improvements on the farm. I have been making my way through the woods working from the ground up. I started by using the brush mower to clear the knee high shrubs and trees. 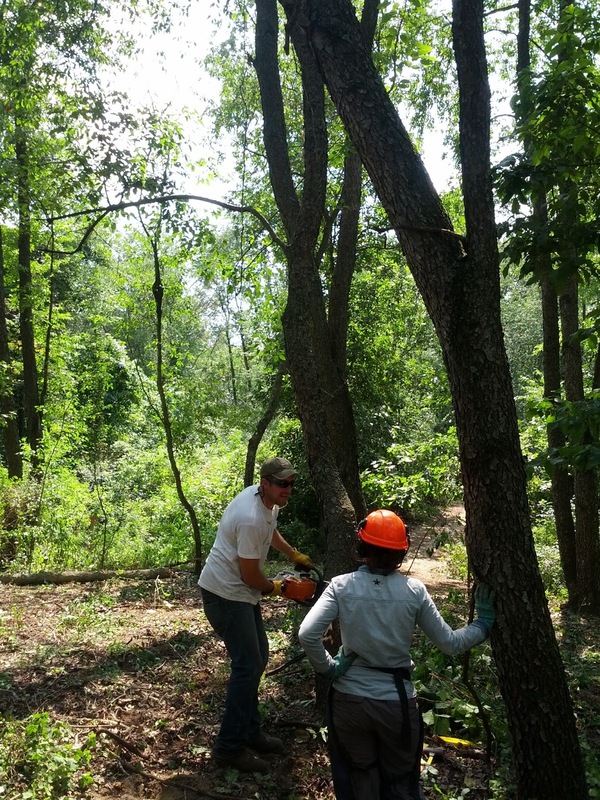 Then, I transitioned into using the brush saw to remove thumb size diameter trees and shrubs. 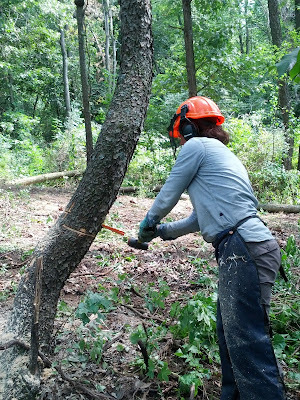 The hand saw (my favorite) came next to cut down small trees (6” in diameter or less). I have been driving the tool cat andusing the bobcat with the grapple. But, up until last week, something had been missing from summer experience. 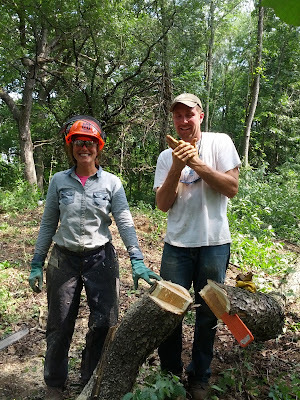 You guessed it—the chain saw! 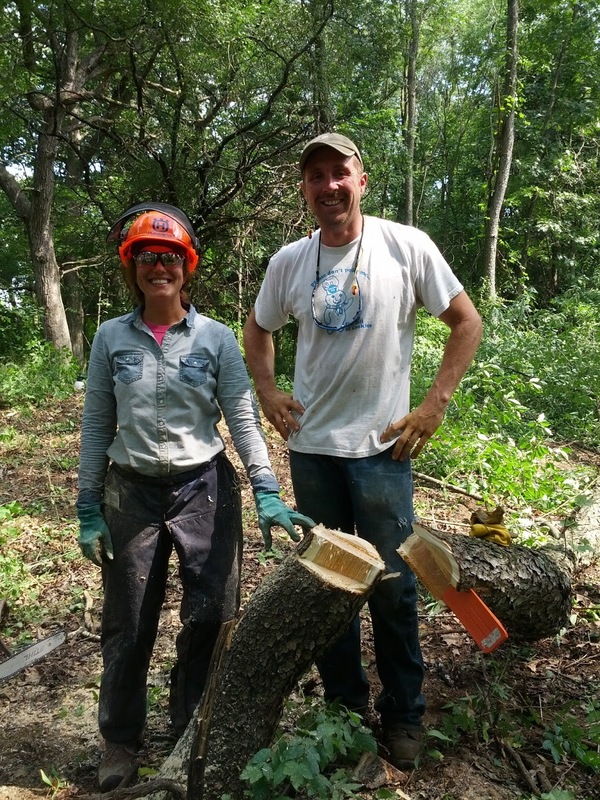 While working the Walbridge Woods, I got my first hands on experience with the chain saw. Arik briefly went over the functions and safety of the chainsaw while we were in the woods, and demonstrated how to do a wedge and bore cut on an Elm before letting me tackle my first tree. Since a picture is worth a thousand words, I created this image to give a better understanding of what a wedge and bore cut looks like. Arik started by using the chain saw to score the bark where I would be making my cuts. We discussed what would happen with each cut, about the tension and compression of the cells and how the cuts would effect them. I started by making a wedge cut on the side of the tree that was facing in the direction we wanted it to fall. Then we sent the chain saw blade straight through the middle of the tree directly behind the wedge cut. Then I put plastic wedges into either side of the hole I created using the bore cut allowing some of weight of the tree to be on the plastic wedges. Then, I made a cut behind the wedges to release all of the tension on the tree and allowing all of the weight to be on the plastic wedges. Finally, using a rubber mallet I pounded the wedges further in, and it fell to the ground. I was quite nervous about using the chain saw to fell a tree, but after watching Arik’s demonstration I found it be a bit anti-climatic. I had envisioned the tree coming crashing down while I was slicing through it with a chainsaw. 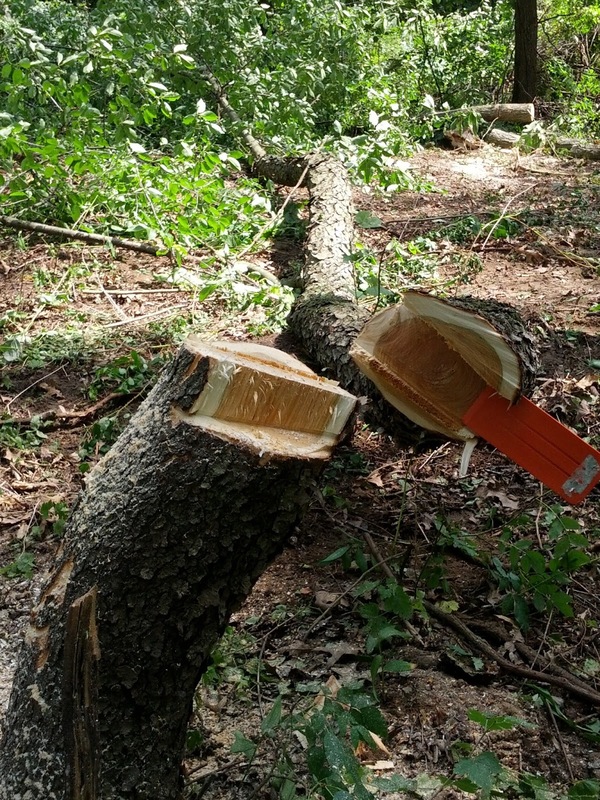 Using the method that Arik taught me, the chain saw was not running and placed in a safe location on the ground and we essentially had complete control of where the tree was going to fall. Thanks to Graham we have pictures to prove it! I have read your post.Thanks a lot for the review! I was thinking of getting a battery powered saw and matching hedge trimmers for trail clearing as well. This review is making that decision a lot easier. In order for your bonsai tree to grow properly, you will need some tools to keep it maintained. With these specific tools, shears/scissors, concave cutters and wire cutters, it will make your plant maintenance a lot easier. One of the most common questions people have when researching timber frame homes is how much do they cost? Do timber frames cost more than conventionally "stick built" homes? What is the price per square foot? 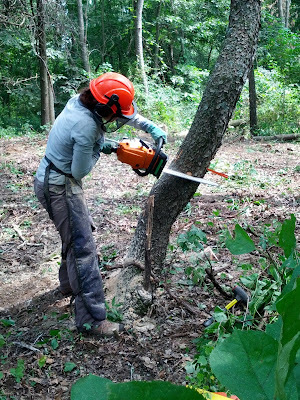 Chainsaw is the best tools which easy for cutting and efficiently. I am happy to use this machine over than 2 years.I totally love the chainsaw so I regular read chainsaw related article.Thanks for sharing great information with us! amazing !!! good work. keep it up. find electric chainsaw 2018 from here. Who is Susan? And how did she get a blackeye? 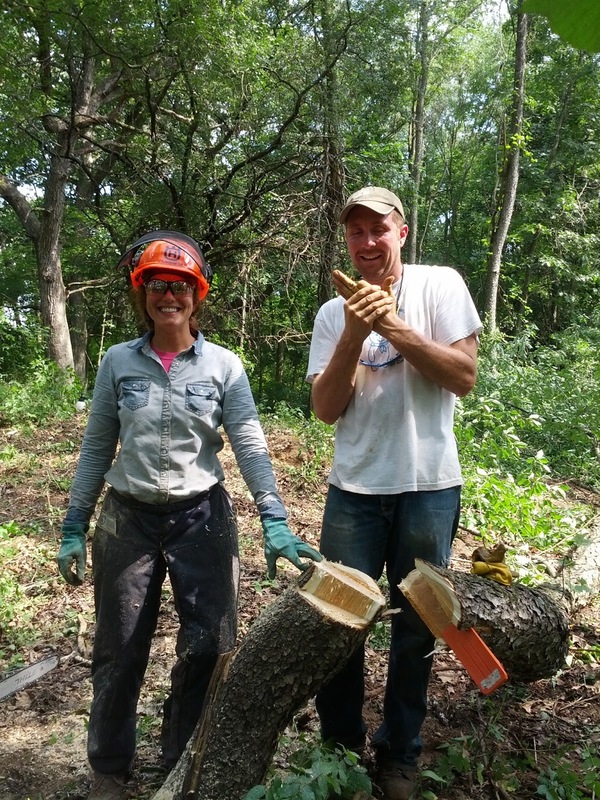 National Tree Farmer of the Year!